Early this morning before the temperature rose to the high 90s, I picked Japanese eggplant, tomatoes, and basil from the garden and returned to the cool of the kitchen to work on a new recipe: I felt like a contestant in my grandson Austin’s favorite show–Iron Chef–with eggplant as the secret ingredient. 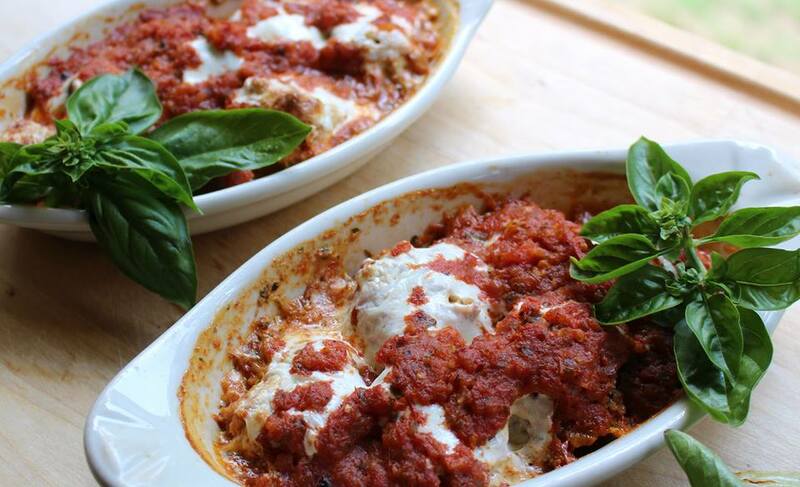 My mission was to create a gluten free eggplant parmesan served with a smoked tomato sauce. Culinary adventures are so much fun (and I don’t have to leave the house)! For breading, a combination of gluten free bread crumbs and almond flour were used. In addition, I baked (rather than pan-fried) the eggplant and smoked the tomatoes on the grill. Might try my stove-top smoker next time to deepen that smoky taste. The results met my criteria: a light, not heavy, non-greasy eggplant parmigiano that is gluten free. Who knew! Step 1: Slice eggplant into 1/2 inch rounds, sprinkle with salt, and allow them to sweat for fifteen minutes. Rinse with cool water; pat dry. Step 2: Mix bread crumbs and almond flour in a medium bowl. Whisk the eggs and water/cream in another medium bowl until light and fluffy. Step 3. 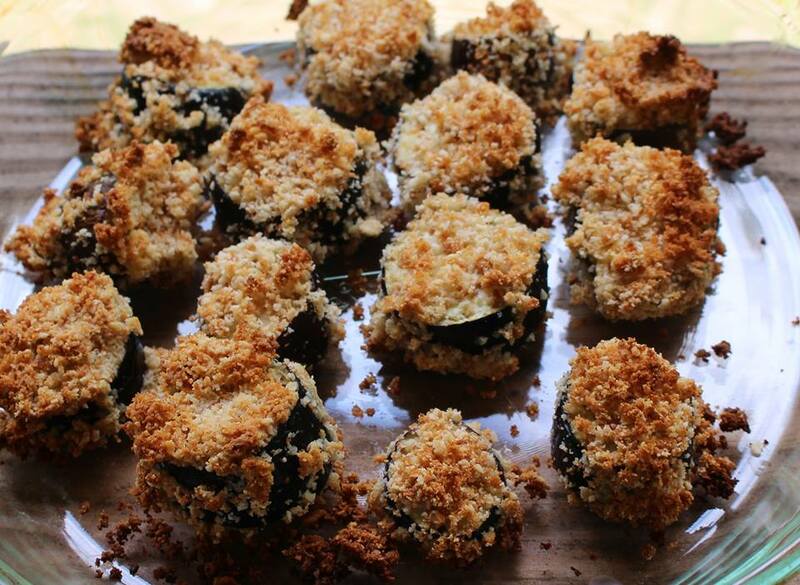 Dip egg eggplant into egg mixture, then into almond flour/bread crumb mixture. Place on sheet pan. Bake at 425 for fifteen minutes or until crumbs have browned. Cover lightly with foil and bake another 20 minutes. Step 1: Prepare grill (400 – 500 degrees). Place soaked chips in a firebox and place on the back of the grill. Step 2: While the grill is heating up, core tomatoes, pack them together in an aluminum pan with solid bottom. Insert a piece of garlic clove into the cored center of each tomato. Season with salt and pepper. Complete the process by drizzling a little olive oil over the top. Step 3: Slice 1 large onion into 4 – 5 rounds (keeping them whole). Season with salt and pepper. 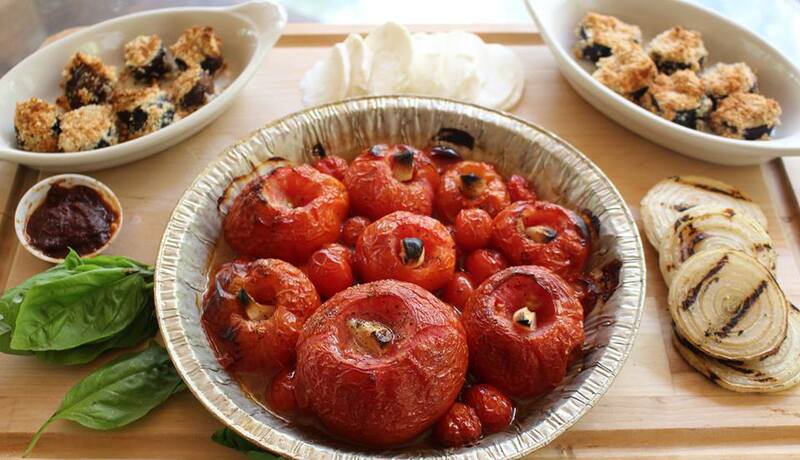 Step 4: When the fire is ready, place the pan of tomatoes on the grill until slightly charred (45 – 55 minutes). About 10 – 15 minutes before the tomatoes are ready, add the onion rings to the grill. This way, the tomatoes and the onions will be ready at the same time. When finished, remove from the grill and allow to cool. Step 5: In a food processor, add basil and pulse until shredded. Next, puree the grilled onion, grilled tomato mixture (including the juices), chipotles, butter, and balsamic vinegar. Pulse until smooth and then check seasonings, adding salt, pepper, and dried oregano if needed. Step 6: In individual casserole dishes, place a layer of eggplant. Top the eggplant with slices of mozzarella. Finally, ladle a healthy portion of the tomato sauce over the cheese and eggplant. Sprinkle with parmesan cheese and return to the oven. Bake for 15 minutes or until the casserole is bubbly and cheese is melted. Sprinkle with freshly chopped parsley and basil floret, then serve immediately. Ho pulito il mio piatto!